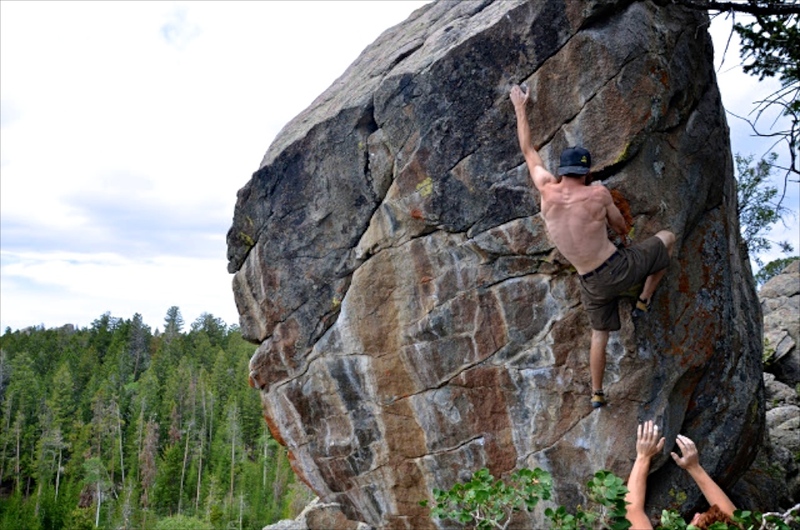 Five Reasons to Make a Bouldering Trip to Lander, Wyoming // Beyond the Scenery, Solitude, and Solid Stone. Beautiful uncrowded landscapes, and some of the best granite you’ve ever touched, can’t make a bouldering trip worthwhile on their own. 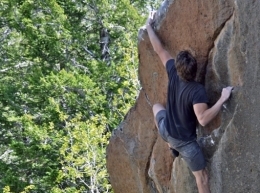 It’s the character of the problems you climb that truly makes a bouldering trip memorable. 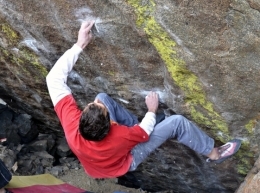 David Lloyd climbing Honest Joe – V8. Photo by Jesse Firestone. I’ve been told that Todd Skinner did the first ascent of this tenuous, technique dependent line. After years of trying various sequences I’d almost given up. And I began to believe the rumors that this problem was really V9 or even 10. 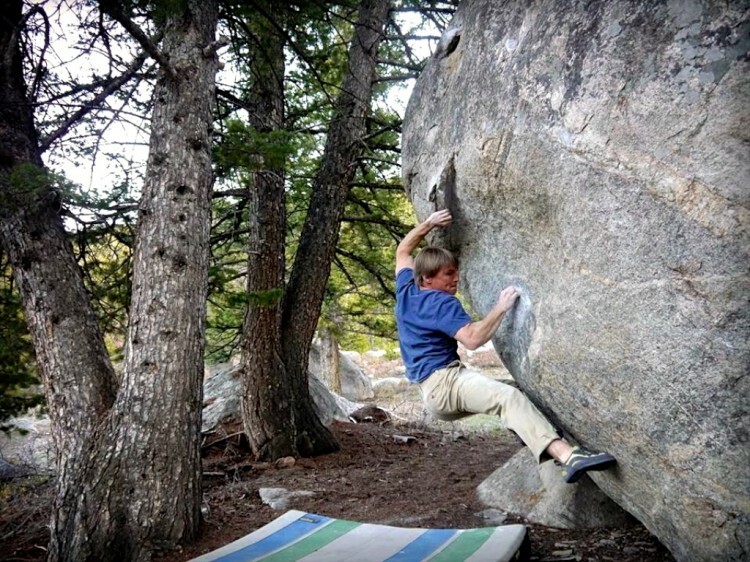 The truth is that there are a few ways to do the problem if you’re strong enough to climb V10s, but probably only one way to do it if your limit is V8. Will you be able to figure it out? Plan a visit in the Fall if you’d like to improve your odds. 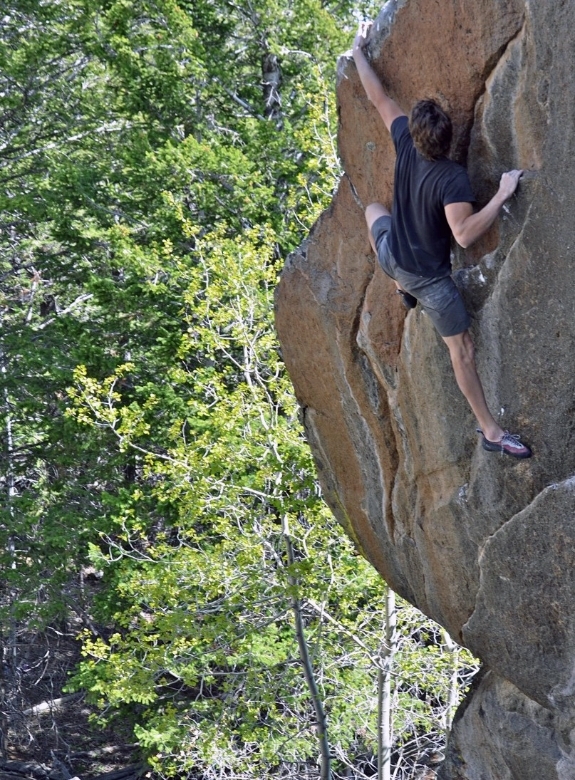 Mitch on Nexus, a V6 at the Rock Shop. Nexus is perched well above most of the Rock Shop on the summit of a formation. It’s best to try it when it’s shaded in the late afternoon. That’s when the rock is cool and golden light illuminates the forests below. 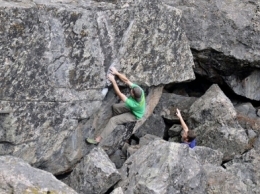 Perfect full pad crimps lead to a sloping summit, and the true crux of the problem. Despite the fact that the landing isn’t bad, and you’ll hit the pads even if your left foot slips off the edge at the lip, the problem’s exposure is accentuated by the boulder’s position high on the formation. Can you still commit when surrounded by all that space? You’ll have a memorable ascent if you do. 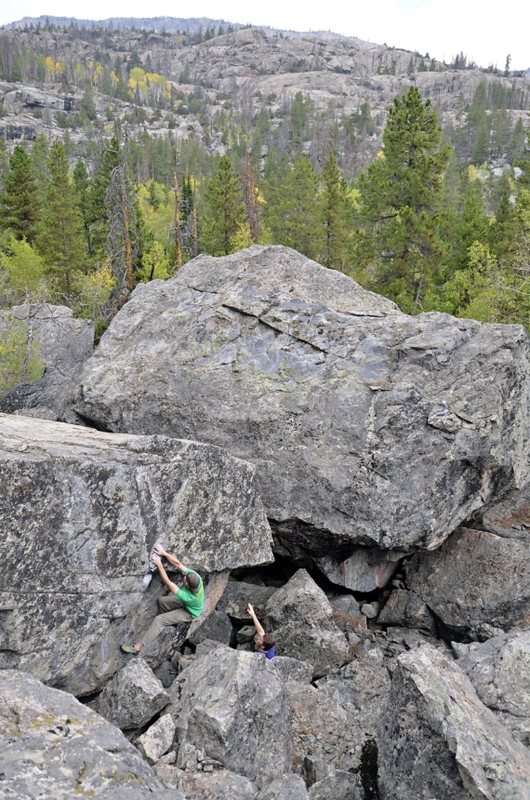 It’s a boulder problem that might make you glad you’ve climbed trad. It’s the “Germ Free Adolescence” of the Lander area. 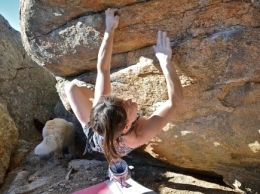 Ashley climbing the Hampi Boulder Traverse – V7. 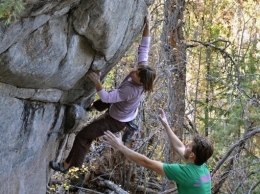 Or maybe you’re into bouldering because you don’t like being scared. 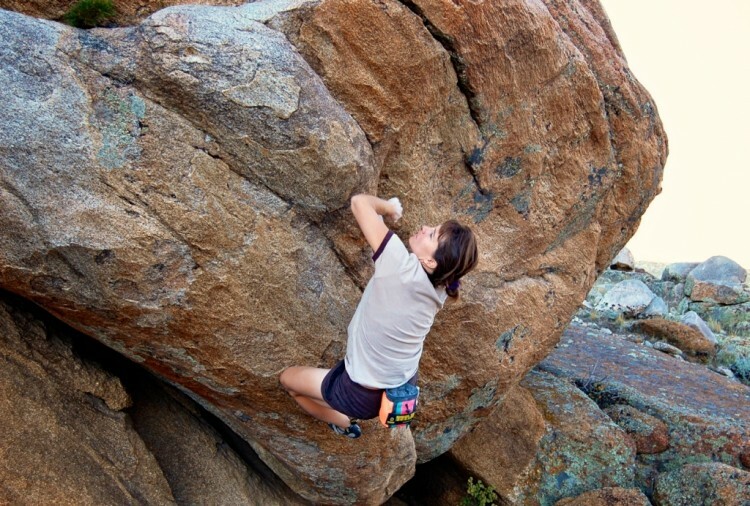 The Hampi Boulder Traverse will let you push yourself to the limit without holding back at all due to fear. All the hard moves are only seven feet off the ground, and after catching the big swing in the power crux at the middle of the 30 foot traverse, holding on through the slopers is the endurance crux. All the holds on this line feel great to grab, and it feels so good when you make it to the tall slab at the end. The holds at the end are good! If you make it to the end of the traverse, you’ll definitely be fine climbing to the top. Just make sure to shake out your arms for a bit before you finish it off. 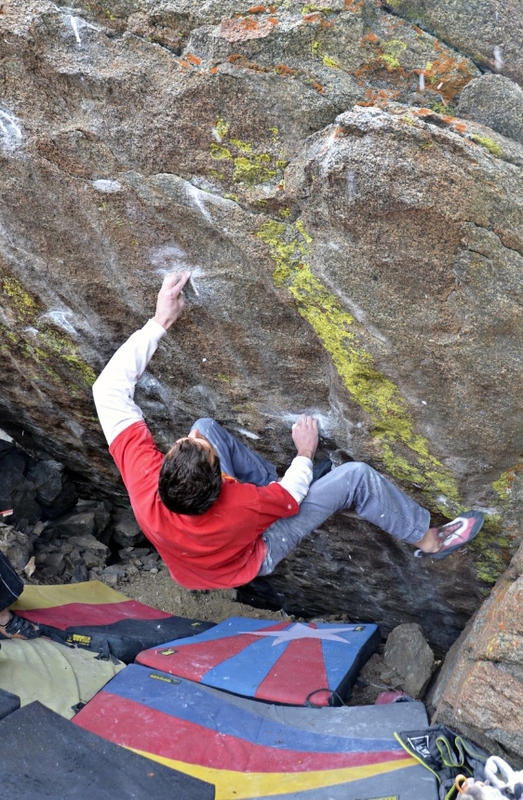 Brian Capps making the first ascent of Wind in the Willows – V8. The Ice Cave has a nice snow landing until late July. 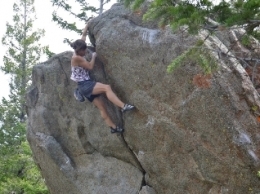 So on the hottest days of Summer you can still climb perfect steep granite in crisp temps. 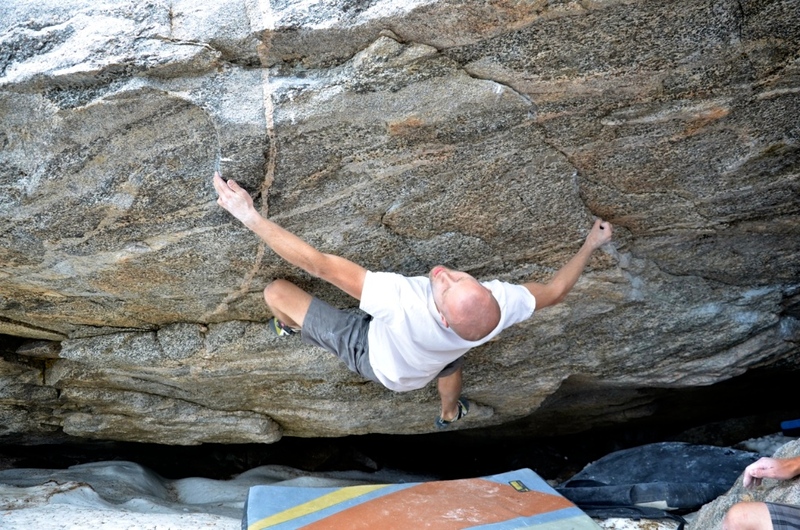 Many boulderers would say that World Conqueror V9/10 is the best line in the Ice Cave, and they’re probably right. But I’m either too short or too weak to climb that one, so I’m recommending Wind in the Willows instead. Each move on Wind in the Willows is just a little bit easier than the last one. The problem’s grade is quite solid, but if you make it through the crux at the beginning you still need to keep on going until it’s over. I devoted four days to working on the line, and when I finally did it, I just barely made it through the V3 top out moves. I was so sapped after doing the beginning. I’ve never found another line where I could try so hard, for so long, and still manage to finish. What a workout! 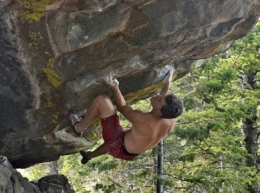 Davin Bagdonas scouting in the Cirque of the Boulders. Honestly. 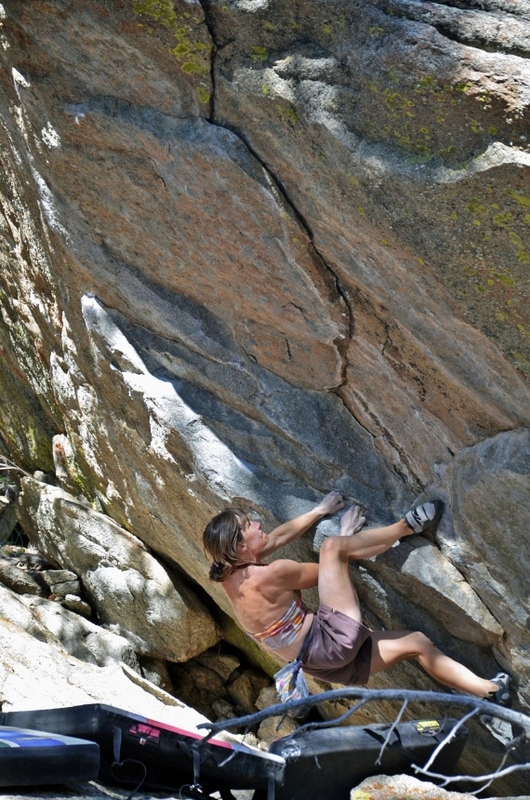 You don’t need to hike all the way out to the Cirque of the Boulders to put up amazing new problems near Lander. Every area in the guide still has open projects, and plenty more rock waiting to be cleaned. Outside of the main areas at Sinks, I’d estimate that less than 50% of the good lines have been done at any of the areas included in the guidebook. So it’s easy to find an unclimbed line that inspires you, and make a first ascent. 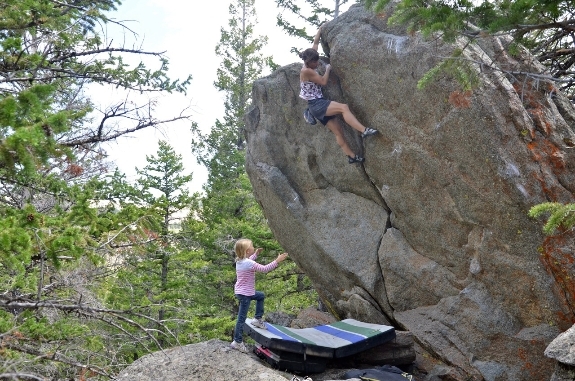 With so many undeveloped blocks, Lander is quite different than most other bouldering areas you can visit. In most places, either the vast majority of the problems have been done already, or little has been developed so you need to clean everything that you want to climb. 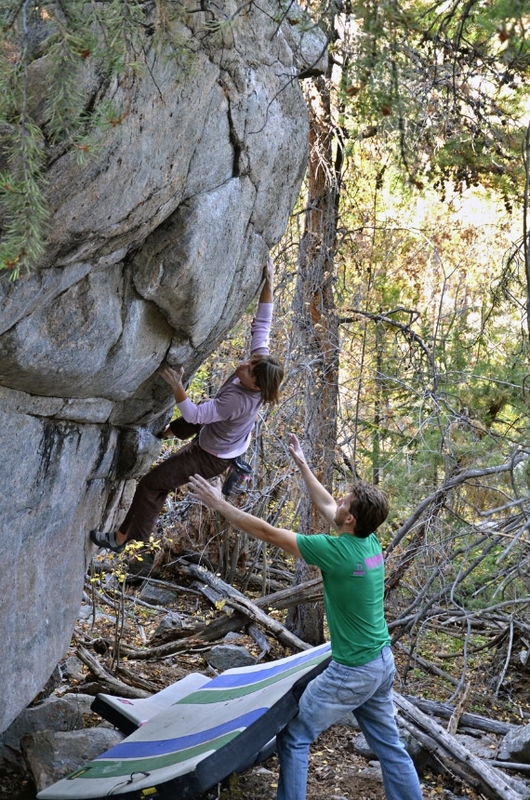 In Lander, each area included in the guide has plenty of established lines to do, but by walking just a little farther, or in another direction, you can easily find your own bouldering adventure. 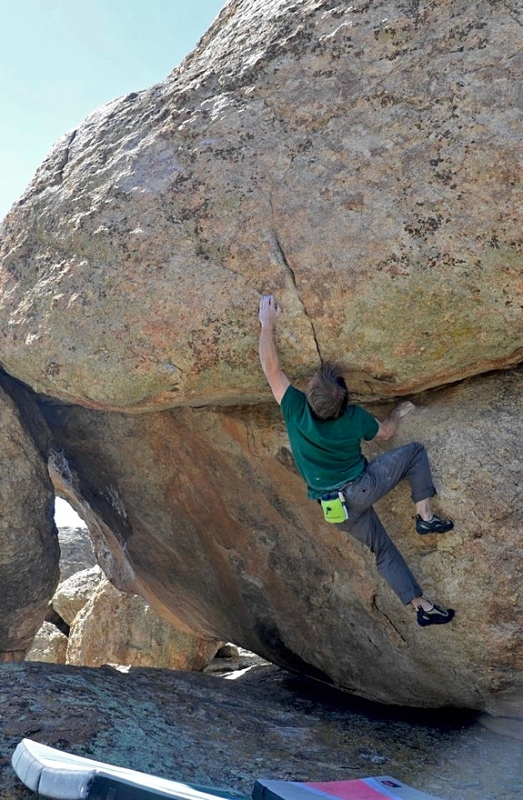 If you send information about your ascent to me, I’ll make sure that the Lander bouldering community remembers you’re addition to the boulders. 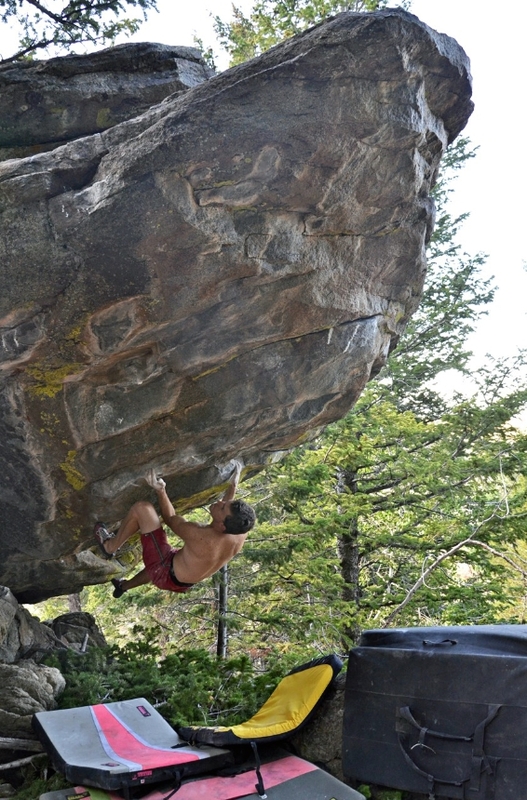 So that’s just five great reasons to make a bouldering trip to Lander. 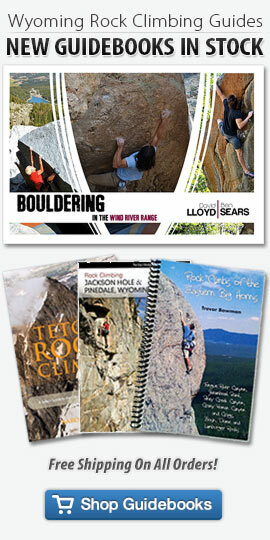 In the Lander Bouldering guide, you’ll find hundreds more. 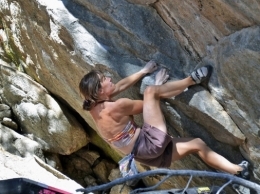 And thanks for taking good care of our bouldering areas when you’re here. 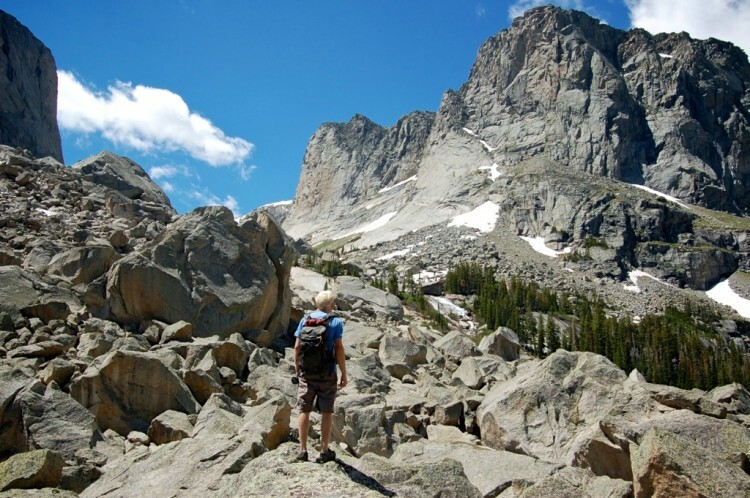 Select photos from David Lloyd’s guidebook: Bouldering in the Wind River Range. Select a photo to enlarge. Photos copyright by David Lloyd. 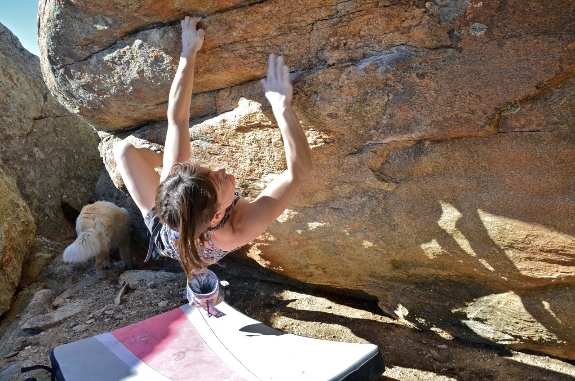 Really enjoyed your pictures and great descriptions of the bouldering areas! Always adjust the mind to what is possible, never adjust what is possible to the mind. 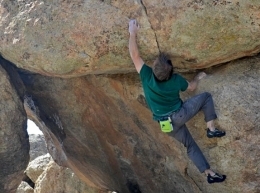 Free mini-guides and climbing articles from the Cowboy State. Take a photo tour of climbing in the cowboy state.